When you identify high potential in your employees – and implement a robust process to review and manage that talent – you develop your future leaders. Identifying those with high potential requires to you to pinpoint, highlight and flag those capable of progression. But how can you spot those with potential? Before being able to spot potential in individuals, you need to understand what the indicators for success in your particular organisation are. What are the behavioural precursors of superior performance in more complex or more senior roles? Often these indicators can be identified by carrying out biographical career interviews with current high performers and looking back at what set them apart at an early stage in their career. Are there common predictors of high potential future success? Some organisations are clear on what potential looks like for them. Others are not. In our experience there are some common HiPo – or high potential – indicators. Resilience – being able to recover quickly from setbacks, coping with high pressure and demands, finding ways around obstacles; perseverance in the face of adversity. Strategic thinking – longer-term thinking, looking outside the organisation for opportunities, seeing patterns, trends, themes and relationships, being able to manage ambiguity and deal with increasingly complex issues, problems, timescales and information, systems thinking, seeing things from an organisational perspective. Flexibility – being able to adapt communication, influencing, leadership and interpersonal style to suit the demands of the situation and the other people involved, managing change, shifting one’s approach in response to new priorities. Emotional intelligence – being able to accurately recognise and manage one’s own emotional states, recognising and understanding emotional responses in others, using this understanding to increase interpersonal effectiveness. Drive and motivation – being a ‘self-starter’, actively seeking out opportunities to learn and stretch oneself, showing a drive to make a difference, actively managing and planning a career, setting stretching personal goals. The next challenge. How do you assess these? Once you know what you’re looking for, then you have to assess for it - and find ways to detect it. Fortunately, psychology and technology offer us more robust and reliable ways to assess potential. Assessment centres and psychometric tests can be used but more easily deployed is a 360 degree feedback tool. 360 degree feedback is the opportunity to understand an individual’s current competency level. Some 360 degree feedback software helps you to look beyond today’s competencies. We have developed the functionality within our award-winning Talent 360 tool to ‘flag’ those statements or indicators within a 360 questionnaire which are the high potential markers. It helps in the review of all the feedback to see how people have been assessed by their colleagues, managers, direct reports and so on. 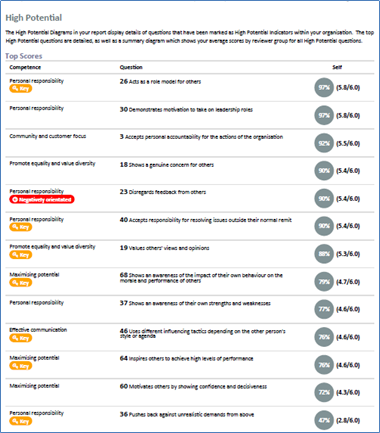 Of course, these ‘markers’ are not shown when the individual completes the questionnaire, but when the report is generated, a composite high potential (HiPo) score is given as a visual summary on a separate page. One of the most critical uses of your information about those with high potential will be in your succession planning. 360 degree feedback has an important role to play here too. The benefits of identifying those with the potential to be a future leader extend beyond future-proofing your organisation. You will be creating an environment for strong engagement, career conversations and regular performance check-ins. In organisations where potential is identified early on, and a succession plan is in place, people are more engaged, they develop their own career plan and understand the next step to take. Talent Management software to help spot high potential and identify the leaders of the future. Talent 360 has a unique feature which helps you develop your own high potential indicator – invaluable for spotting future leaders. Talent Successor provides the ability for you to build and monitor talent pools for critical roles. Talent Performance offers an easy to use and quick to access online system for all employees to track their own performance objectives and their progress against these. It gives them a ‘wall’ on which people can post feedback giving instant feedback on how they are doing. Talent Navigator helps employees to plan and map their career through your organisation: when they see their future path mapped out and decide to stay, you can better plan for talent succession. We’re with you every step of the way as you do this; we know the importance of getting it right when you introduce new software and processes. When you are ready to talk through how we might support you to help identify your talent with high potential, let's arrange some time. It you want to take a look at how a cloud-based 360 degree feedback system can help you identify those with high potential or capable of being your future leaders, get it touch.